Cotton Ball – RSVP Below! 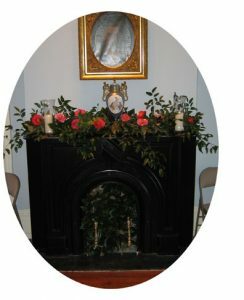 Available for rental for any small gathering that would be enhanced by being held in a truly historic home in Downtown Augusta. The Lamar House was built in 1860 and used as the parsonage for the First Christian Church. The future Supreme Court Justice, Joseph R. Lamar, lived here with his family from 1860 to 1875. Joe was the boyhood friend of the future president, Thomas Woodrow Wilson, who lived next door in the Presbyterian Manse. The site is unique in that there is not another location in America where a future president and supreme court justice lived next to each other as young boys. Both homes are listed on the National Register of Historic Places and are now owned by Historic Augusta, a private, non-profit organization. The rental space consists of two spacious formal parlors separated by pocket doors and an adjacent smaller parlor with a beautiful bay window. There is also a fully equipped kitchen and landscaped outdoor area. We’re available Sunday through Saturday, 8 a.m. to midnight. Rental also includes a complimentary tour of the Boyhood Home of President Woodrow Wilson, upon request. call 706-724-0436 Monday through Friday 8:30 a.m. to 5:00 p.m. The mission of Historic Augusta, Inc. is to preserve historically or architecturally significant sites in Augusta and Richmond County, Georgia. © 2019 Historic Augusta Incorporated. All rights reserved.